Fahina is a mother of five (5). Her husband left her and the children and left them with the bad car. So often this is a terrible reality. Fahina attends the Weekly Women’s Worship (WWW) at Parramatta Seventh-Day Adventist Church and asked the women there to pray for a vehicle for her. So they did. The car died as a result! But in the process, $6900 was raised to replace the vehicle. Not to be outdone, God gave prayer warrior Orette Collen an opportunity to speak in Melbourne (Victorian Adventists) recently where she shared the testimony of the group as part of her sermon. In the audience was a Sevvie car dealer. 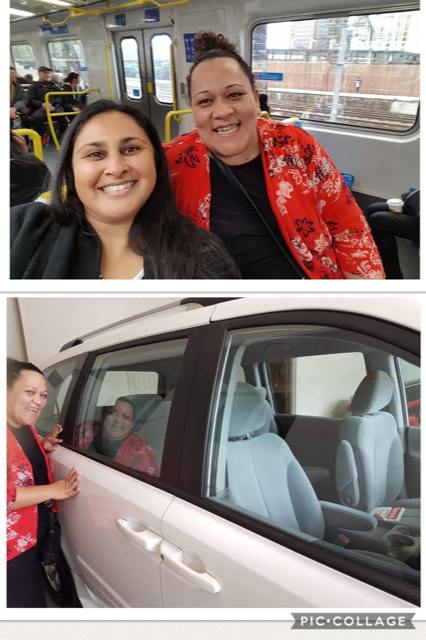 He happened to have the perfect minivan on site: a Kia Grand Carnival with a clean engine, new tires and the works and offered it for the price of $6000 (leaving Fahina with enough to cover rego and fuel for the drive back to Sydney). Not only that: He used his own mileage points to fly Fahina and a friend to Melbourne to pick up the car! She now has a way to transport her 5 children and all the gear back and forth to school––one of our schools!––to church and everywhere else they need to go in life. God is good ALL THE TIME. Below is a picture of Fahina and Natalie, the WWW member who launched the fundraiser to get Fahina a new car. Let us rejoice and be glad with this beautiful family. PS: The family have decided to name their new car Grace.